WHAT: Americans have been bombarded with reports of a democracy in decline, intensified recently by the longest partial government shutdown in U.S. history. Ideological divisions and partisanship have further diminished an already historically low trust in governmental and civic institutions. 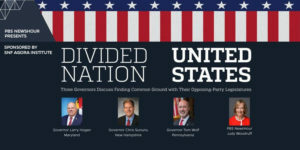 Although this troubling diagnosis holds true at the federal level, states from Massachusetts to Montana have elected popular governors from the minority party who are discovering innovative ways to reach across the aisle and achieve consensus. What can we learn from these leaders? Are their successes attributable to politics, policy, or personality? What ideological continuities, habits of mind, or policy priorities do they share? PBS NewsHour anchor and managing editor Judy Woodruff will moderate a conversation with Maryland Gov. Larry Hogan, Gov. Chris Sununu of New Hampshire, and Gov. Tom Wolf of Pennsylvania. WHEN: Monday, Jan. 28, 2019 7 p.m.
LIVESTREAM: The event will be livestreamed by PBS NewsHour at pbs.org/newshour. TO ATTEND: To cover the event media must RSVP to Jill Rosen, jrosen@jhu.edu. The event is free and open to the public, but advance registration is required. BACKGROUND: The SNF Agora Institute at Johns Hopkins University was announced in 2017 with a $150 million gift from the Stavros Niarchos Foundation. It serves as an academic and public forum dedicated to strengthening democracy by examining the root causes of polarization and developing and testing new ways to foster civic engagement, inclusive dialogue and the open exchange of ideas. The Institute will bring together a diverse group of scholars and practitioners to support these efforts.